In September 1917, Voss was flying in his Fokker Triplane, when a flight from No. 56 Squadron bounced him. 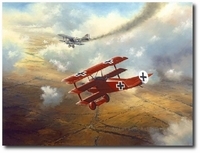 In an epic dogfight, Voss held his own against seven S.E.5's led by James McCudden. All seven of the British pilots were aces, yet Voss outflew them and filled every S.E.5 with lead. 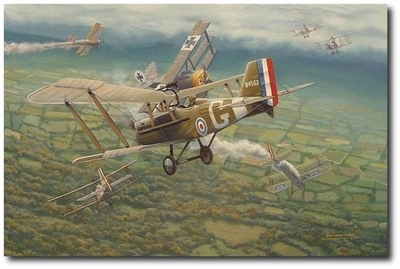 Finally, the German received a telling blow from Lt. Rhys-Davids, and the Fokker fell to the ground and exploded. Voss died before he could celebrate his twenty-first birthday.